This is a teen parenting and relationship guide by the ultimate authorities in psychology. Christine Evans is a columnist, TV and radio agony aunt, and a qualified psychotherapist, specializing in parenting ,anxiety disorders, and family concerns, known for her sound advice. Dr. David Usher is an MD, family planning specialist and clinical sexologists. He is the author of numerous books and a regular guest on both TV and radio. "Enjoy them now, they'll soon be teenagers!" Warnings like this from friends and relatives, together with media images of adolescents as irresponsible, rebellious troublemakers, can lead parents to expect trouble as their children enter puberty. It is a rare parent who does not approach a child's adolescence without some misgivings. But family life does not have to be a battleground during the teenage years. If your child constantly misbehave and ignore or refuse your requests for proper behavior? If your relationship with your child based on conflict instead of mutual respect and cooperation then this book will help you to create a positive, respectful, and rewarding relationship with your child. 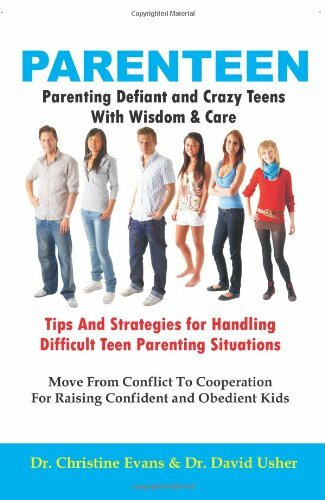 This book focuses on strategies parents can use to deal with typical teenage behavior. The essence of their technique teaches parents to allow their children to learn about solving their own problems by setting up choices and consequences. The contents gives solid tips on how to work toward a positive outcome and offers a variety of scenarios, demonstrating precisely how a parent's words and actions can be the source of a teen's compliant or defiant response. When parents and teens are getting along, family life can be wonderful. Teens really are enjoyable and energizing. Their wit and high spirits make them fun to be around. Although this guide is intended mainly for parents of teenagers, it is general enough to be useful to parents of younger children as well.